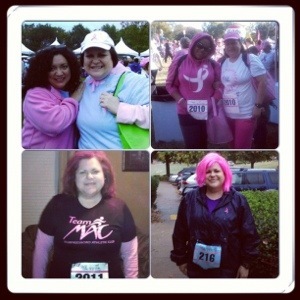 On Saturday, I ran the Komen for the cure 5k in Nashville for the fourth time. I was pleased at my results. It started off chilly and wet but I was prepared. I prefer running in cooler temps anyway. I finished in the top 200 (out of around 26,000) even though most participants walk the course….but I’m proud anyway! I came across my race pics for the last four years and made some observations. I look fitter and healthier, I can run more than I could back then, and I am much happier! The pics are in order left to right starting at the top. I’m thankful for sticking to my fitness goals even when I get discouraged. This year I wore a pink wig – a nice touch. 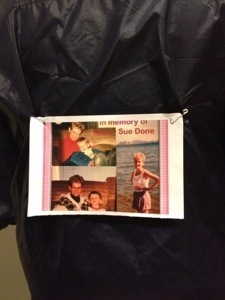 I also wore a picture of my mother in law, Sue. She is the reason I started doing this race. She lost her battle with breast cancer before I got a chance to meet her. 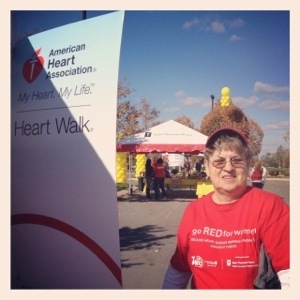 I also participated in the Heart Walk this weekend. My mom and I usually do this together in memory of my grandmother Lola. I’m proud of my mom for walking the three miles, since she isn’t used to walking that distance at age 73.